To complement the well-designed covers in the range of pictorial calendars, we now have the option of creating a personalised cover to include your own logo. This subtle approach doesn’t distract from the design of the cover and retains the look of the calendar at the same time as promoting your brand in a prominent position. By placing your logo on the cover, you can ensure your customers recognise your business and ensure your calendar is hung on their wall or displayed on the desk. Personalise your calendar further by integrating your company’s brand colours into the calendar with coordinating colours in the date pad and month headings to match your advert. This option is available on 6 leaf memos, central spiral postage savers, 13 leaf postage savers and slimline titles. 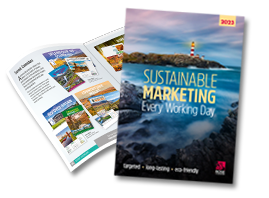 Stand out from your competitors by using your recognised brand colour throughout your personalised calendars.